The family and I took a little trip down to Monterey for the weekend. Visited aquarium. Enjoyed Dennis the Menace playground. Spent copious times climbing rocks at all times of tide. Climbed way up a rocky bluff to this lovely scene. 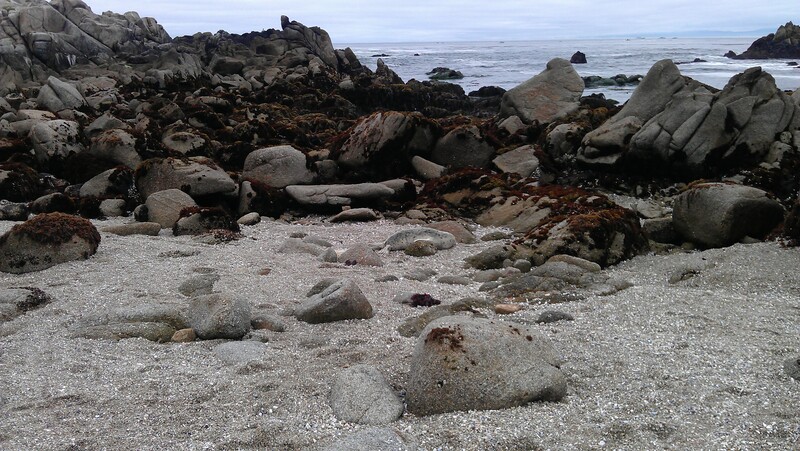 Then down the other side to this shell-deposited beach between gorgeous outcroppings of granite. And on that beach, halfway between high and low tide, we stepped carefully around small tide pools, watching crab and snails and fish and anemone adjust to their temporary life in a warm pond. 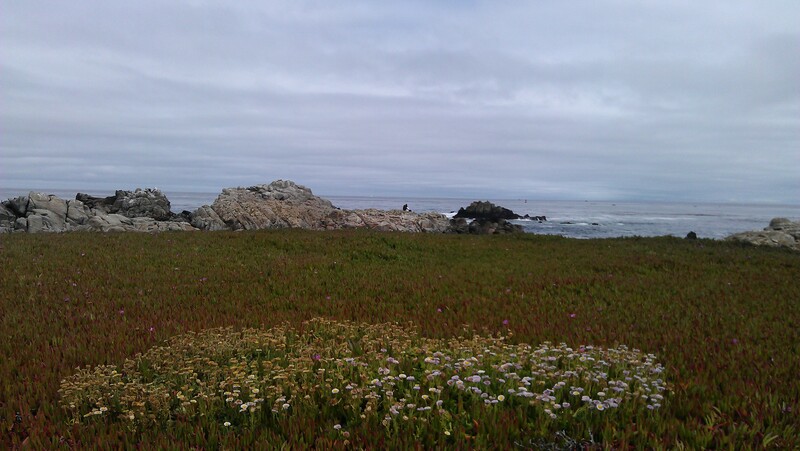 We marveled at a distant rock island, maybe half a mile away, that held three young seals. And we wanted to get closer. So we weren’t really watching as carefully where we stepped. 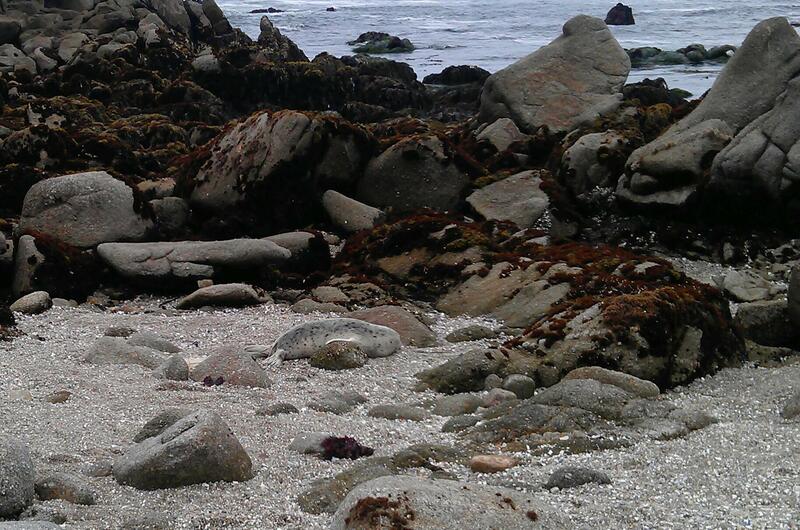 After all, we were among only shells and rocks at this point in the tide-pool search. We almost didn’t, until we were way too close. Poor little stranded seal pup. Every ten minutes or so, another family came carefully picking through the tidal zone, and every one stopped about ten feet from her and stared. And she seemed shy. Sad. Lonely. All the anthropomorphic adjectives I could heap on a baby without her mama. We checked the ground to see how wet it was, debating whether the high tide would really come bring her back to her family. Everybody else marveled at her and moved along. The kids kept asking, “Is someone going to make sure she’s okay?” Spouse and I explained about the tide and about how she could wiggle into the water once it came. But I doubted. And as we walked away I came back three times. I googled “report stranded marine mammal Monterey” on my phone. Because that’s why Google was invented, right? The Marine Mammal Center has a hotline. 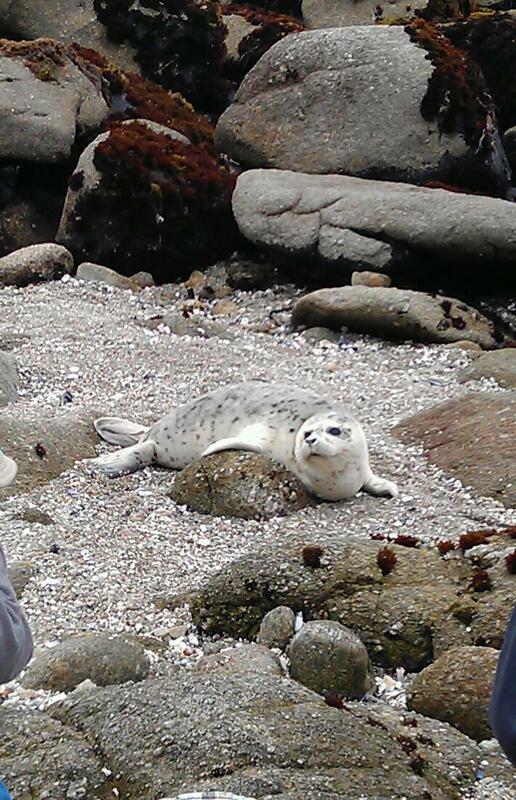 A delightful creature whose name I forget walked me through a checklist of questions about the seal’s size and health. And location. Lots of details about location. And she dispatched volunteers to the site to check on the pup. I have no idea if that baby made it back to the ocean. I have no idea if I’m the only one who called. But I told my kids their first lie today. At bedtime, when my little guy interrupted the nighttime songs to ask if the seal pup was okay, I told him that the Marine Mammal Center emailed me to tell me that she got back into the ocean with no trouble. I should have just said, “I don’t know.” I should have said, “we did our best.” There is no reason to trick kids about happy endings. Heck, we don’t tell them about Santa or fairies or storks, so why tell them that babies are always safe? Well just this once, I want to live in a world where heroes save the day. Where people like the Marina Mammal Center do their best and fight for the voiceless. Because isn’t that what Memorial Day is all about? Remembering those who fight for what they believe in? I hope you’re okay, sweet seal babe. You and every creature on the planet tonight. I hope you’re okay. A special thanks to all the heroes who fight for others, in and out of uniform. Happy Memorial Day. This entry was posted in World citizens and tagged animal rescue, marine mammal center, monterey. Bookmark the permalink. Hi, Kerry! They said they couldn’t find her. 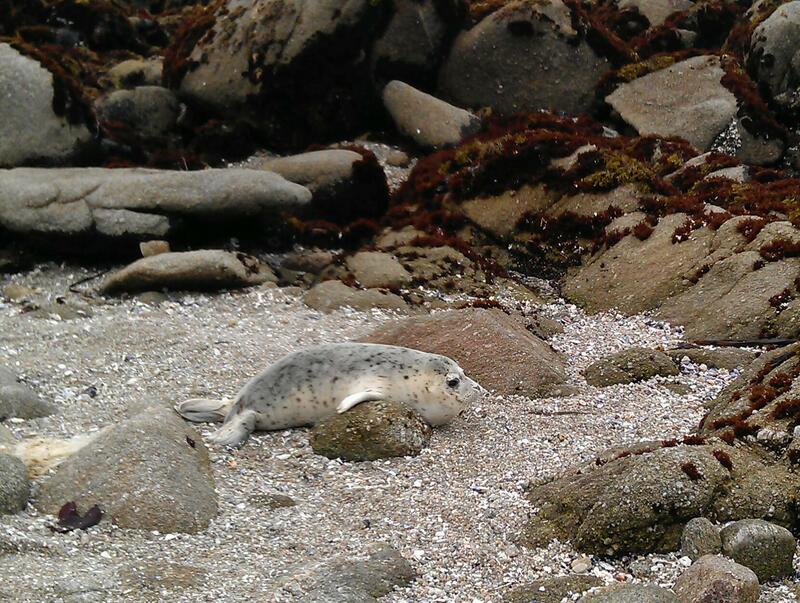 They found the beach, and said it was a perfect place for seal pups. Hopefully the tide did its job. HAHAHA! I saw that little pup in the first pic cuz I wondered what the hell was in the pic other than rocks that you were showing. What a cutie, those big eyes just draw you in. I cried when Nemo’s mom was eaten. I would rather think happy thoughts. I refuse to watch all Disney because they always kill the mom. 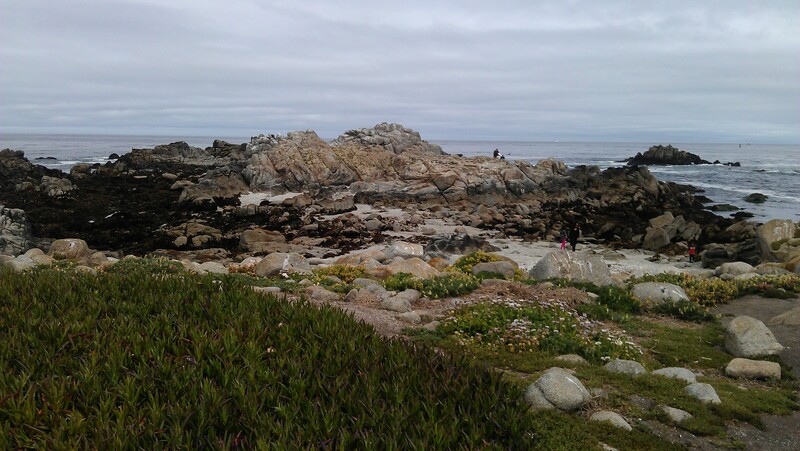 The rocks were so huge and the sea vegetation so extensive we just didn’t see her. Dorks. Now, of course, I see that she doesn’t actually camouflage as well as I would have thought. But well enough for predators, I hope. This is absolutely why google was invented. Thank you for using its powers for good. What an incredible story. Simply beautiful. I’m on the glass half full side and am counting on the tide and a tenacious mama seal to guide her/him. Good gravy, Jane. How did I forget his powerful and wise mama? Of course once there’s enough water she’ll bark him the safest route back to open water. You see how the half-full crowd can genuinely teach the half-empty folks? Nicely played, my buoyant and ebullient friend.